EA has announced Battlefield V will land on PlayStation 4, Xbox One, and PC on October 19. The series has hopped around between conflicts and time periods, but Battlefield V is bringing us back to World War II. 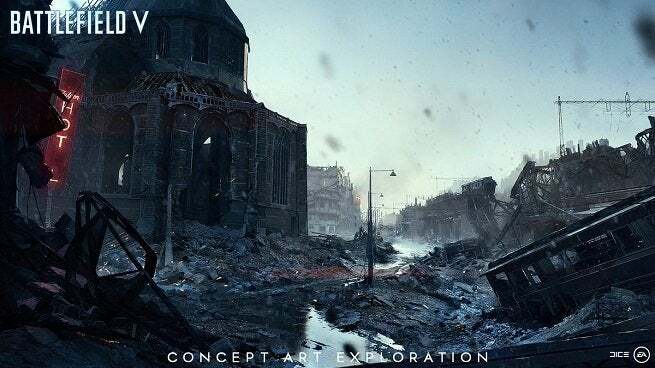 It will have a single-player campaign that's divided into short stories--much like 2016's Battlefield 1--plus an array of multiplayer modes that include both fan favorites and new modes like Airborne. For more information, here's everything we know about Battlefield V.
If you're already sold on the game and are ready to place your pre-order, you may be wondering which version to get and where to get it. To help ease the decision-making pain, we've gathered all the information you need into one place. Read on for the goods. Pre-order Battlefield V at most retailers, and you'll receive a number of incentives and goodies. Here's what you get. Paratrooper Outfit: Choose one of eight Special Soldier Sets to customize your troops. Special Assignments: Earn rewards and get an edge over the competition by completing Special Assignments. Immediate Access to Five Battlefield 1 Weapons: Ready for use in Battlefield 1, unlock five of the Great War's most modern weapons and bridge the technological gap between the two world wars. The standard edition of Battlefield V just comes with the core game itself, but if you pre-order it, you'll also get the bonuses mentioned above. Here's where you can pre-order the standard edition right now. Note that Newegg has it for $50 and that Best Buy is offering a $10 reward certificate with your pre-order. 3 Days Early Access to the Base Game: Lead your Company in all-out multiplayer with new experiences like the massive Grand Operations and the timeless Conquest mode. Play untold War Stories in the single-player campaign--or squad up with friends in the cooperative Combined Arms. Five Sets of Paratrooper Outfits: Customize your soldiers with five Special Soldier Sets containing stunning weapon skins, camo patterns, headgear, and face paint for British Special Air Service and German Airborne troops. Choose these five Sets from eight available when deploying into Battlefield V.
Special Assignments: Battlefield V Deluxe Edition includes Special Assignments for the British Special Air Service and Special Assignments for the German Fallschirmjäger troops. In addition, Battlefield V Deluxe Edition includes Starter Assignments--test your skills on the battlefield and gain rewards. Here's where you can buy Battlefield V Deluxe Edition. Once again, Newegg offers $10 off the price and Best Buy offers a $10 reward certificate for pre-ordering.